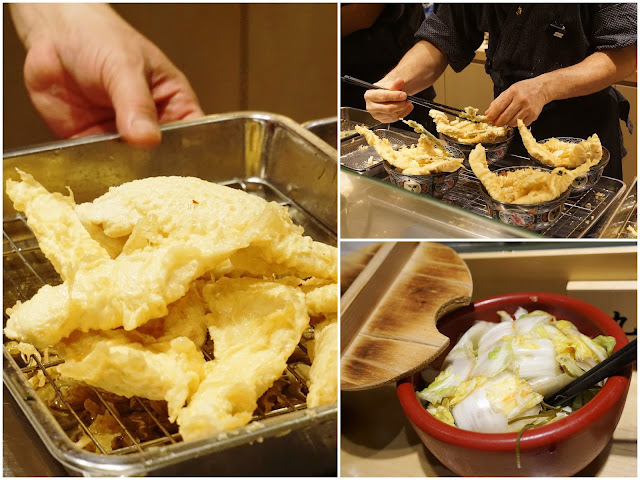 PinkyPiggu: Tendon Ginza Itsuki @ Tanjong Pagar ~ Delicious Japanese Tempura Donburi! Tendon Ginza Itsuki @ Tanjong Pagar ~ Delicious Japanese Tempura Donburi! Keisuke Takeda. Met the celebrity ramen chef twice, a very reserved man. We all know he's the genius behind the highly successful Ramen Keisuke chain of ramen restaurants, but has since started selling gyoza (Gyoza King), oden (Takeda Shoten) as well, and now, opened a tendon shop! 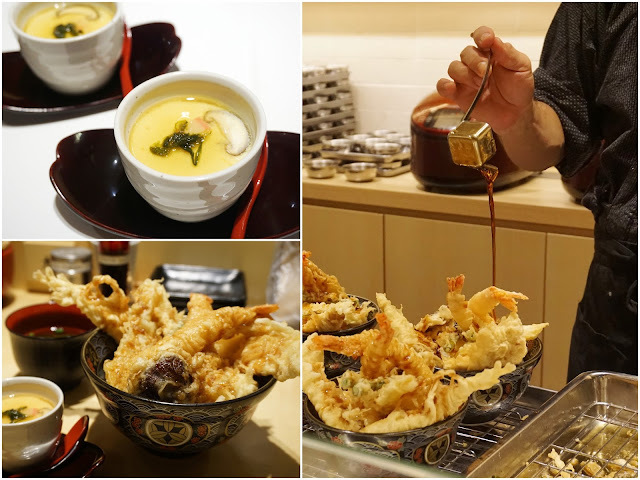 Tendon Ginza Itsuki at Tanjong Pagar is the newest venture by chef Keisuke, a collaboration with Ginza Itsuki Sushi restaurant in Tokyo, specializing in 'tendon' which is short for "tempura donburi" (not sinew the connective tissue lah, you england bery powderful people). Photos of bowls and bowls of Tendon has been appearing in my Instagram feed so often that I thought I must the last one among my foodie friends who have yet to try the popular rice bowl topped with deep-fried sinfulness. My friend warned me beforehand that we will both end up smelling like tempura ourselves. He is right. We were uncomfortably permeated with oil smell and greasiness after the meal. Maybe to sit at the table would make it less so, but I wouldn't pass up the opportunity to sit at the counter where all the actions are. Here, we get to see the donburi prepared right before our very eyes. Separate fryers are used to fry the different ingredients at varied optimal temperature to ensure perfection in result. The menu is very concise, with just two tendon options of either Special ($13.90++ with Prawn 2pcs, Chicken 2pcs, Half-boiled Egg, Vegetables 4pcs) or Vegetable ($12.90++ with Pumpkin, Shiitake Mushroom, Lotus Root, Eggplant, Other Vegetables 4pcs). Each set comes with chawanmushi (steamed egg) and miso soup. Rice upsize is at an additional $1++. Pickles on the table are complimentary. I wondered if that are much takers for the rice upsize when the bowl is already brimming with such generosity of ingredients! At this price point, it certainly makes for a value-for-money hearty meal. We both ordered the special tendon. The deep-fried prawn was especially pleasing with its freshness and succulent meat encased in a thin crisp batter. I wish to have more pieces of those instead of the chicken fillets which, though tender, lacked that touch of fattiness which would make it more exciting texturally. All the vegetables were excellent! A noteworthy mention is the molten-centered egg, and also the housemade special sauce which tied everything together deliciously within that beautiful Arita porcelain bowl. My advice is not to take too long with the photo-taking (oops, guilty!) so as to enjoy the tempura at its crispiest best, and perhaps to make a quick exit after finishing the tendon (oops, guilty again!) because more often than not, there are people waiting in line outside the restaurant for their turn.